Antonee Robinson is knocking on the door for a return to the Wigan Athletic first-team squad for the first time in four months this weekend at Reading. The 21-year-old’s last outing for Latics was in the 2-0 defeat at Middlesbrough on November 10. Robinson injured an ankle the following week on international duty with the USA, preparing for a glamour friendly against England at Wembley, and underwent surgery to correct the problem. He’s been back in full training for over a month, and has frequently been sighted completing drills on a matchday before kick-off – although he has yet to be named in the 18. Robinson stepped up his recovery on Tuesday afternoon with 90 minutes as the Development Squad – also including Callum McManaman and Gary Roberts – beat Port Vale 2-1 at Christopher Park. And with Danny Fox picking up a knee injury of his own during the first-team’s 2-1 defeat at Derby on Tuesday night, the door has been left open for Robinson to take the next step in his recovery. 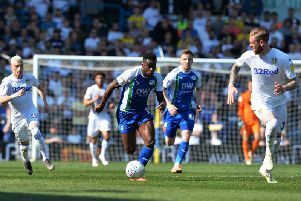 “A couple of lads played in a bounce-game on Tuesday, which will have done them the world of good,” revealed boss Paul Cook. Kal Naismith has been filling in at left-back during Robinson’s absence, but he was surprisingly left on the bench at Derby with Fox switching from centre-back. “I saw it as a chance to bring some freshness into the team,” revealed Cook, who brought on Naismith following Fox’s departure on 25 minutes. “Freshness in the team is huge in the position we’re in, especially in flair positions.